New test results show that Concentric's variable flow oil pump (VFP) can deliver 3% improvement in fuel economy in passenger car applications rather than the figure of approximately 1% that the designers originally projected. This dramatic improvement reflects the drive cycle of passenger cars, particularly in Europe, which make more and shorter journeys, so that the engine spends a much greater proportion of its life operating at low temperature and consequently requires more energy to pump lubricant. Concentric originally designed the variable flow pump for diesel-powered trucks, where the engine often runs uninterrupted for its whole working day and so is pumping hot oil at relatively stable pressures. Concentric's VFP is an annulus and rotor pump that operates by matching oil supply to demand, so limiting the power needed to drive the pump and hence fuel consumption. Concentric has already won more than five development contracts with major European and North American OEMs. 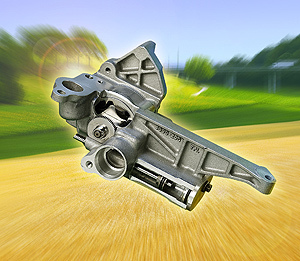 These include passenger car applications and so the original design, developed for heavy-duty diesel engines, has now been spun off into a scaled down version, which is operated electrically via a standard solenoid valve rather than mechanically. The Concentric VFP uses two rotor sets to control oil flow in relation to three conditions- engine load, temperature and pressure. The driving rotor operates in the traditional, fixed arrangement, while the offset position and resultant flow of the second, eccentrically-mounted rotor is controlled either mechanically or electrically. The electronic control system is compact, compatible with all passenger car applications and failsafe. It is extremely robust and, in the event of an electrical failure, would continue to operate as a normal pump. Kevin Johanson, Business Manager of Concentric VFP Ltd. commented: " The technology is proving to offer significant fuel economy benefits for both the fuel-conscious heavy duty market and the passenger car market where even greater savings are being realised. The core of the product is established rotor technology, which has allowed us to achieve the expectations of the heavy-duty market for durability and reliability while maintaining the necessary low cost base. "